The TeamGrid application is an efficient Project Management application specifically designed for small and medium businesses. The company initially wished for an application that not only took care of the tasks for the organization, but also kept a transparency of business through all levels. 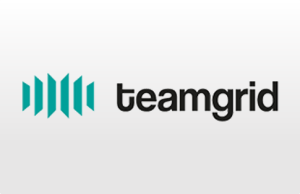 The project of TeamGrid was created by keeping in mind all the issues companies faced. This project offered a smart approach towards project management. The tool efficiently manages tasks for an organization through its task management feature. The dashboard of the tool displays all tasks related to a profile, i.e.Upcoming tasks, My tasks, and Completed tasks. The tasks feature lets you organize your tasks using the easy to use Kanban boards. The tool has a large task grid that provides a perfect overview of all tasks. The tasks are arranged using cards that can be moved with an easy drag and drop to assign them to team members or to change the priorities. The tasks can also be time tracked using this feature. The project management feature in the tool is capable to handle and manage all projects concerned with the profile. This feature lets you manage all your projects and helps you collaborate with teammates or partners. The left panel displays a list of all projects. The integrated rights management provides advanced settings for project’s visibility. The TimeGrid has an efficient capability to manage Business Analytics. 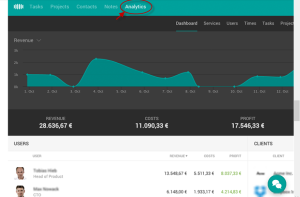 This feature generates valuable data and statistics to evaluate the effectiveness of projects, customers and employees. The TimeGrid Business Intelligence is generated from more than 100 data points in real-time with straightforward and detailed statistics about the efficiency of projects and their values for the company. The tool helps you better track your projects by creating notes that will help you remember little things that you often forget to keep on tips. The Notes panel will display a list of all the notes with information such as – who created it and time of last modification with a brief description about the project it is related to. The application seamlessly integrates with Slack so that you receive all your personal notifications directly in Slack. you can create a connection between TeamGrid and Slack to receive your personal notifications in Slack Direct Messages. Projects can also be connected with Slack to connect an receive project related notifications inside Slack. The tool offers instant chat support even before you create an account. Other than this, in-app, telephone and email customer service and support is available free of charge. The tool also has an in-the –app guide that helps users with all the tasks and associated features of the application. The Application also offers API and extensions for the user’s facility to use the app. Efficient in Budget Management, Idea Management with time and Expense Tracking. The app lacks email integration, File sharing and issue management. Other important features such as Portfolio Management, Resource Management, etc. would also have added value to the application. TeamGrid is an efficient tool for complete Percent Tracking keeping the expenses related to the projects. The tool gives a quick analysis and details using Gantt Charts keeping all the tasks and projects organized. For more details, please visit: Teamgrid website.